Painting over height benchmarks...erasing history. This clever chronological conceit serves as a microcosm for the movie as a whole: there’s a subtle symbolic link between the height measurements on the door jamb and the progressive growth of the children over the course of the film. In a sense, these markings are a type of baton handoff, since the tick marks on the door signify events that have transpired before the story begins. This brief visual device gives us a sense of history and is a springboard for the movie’s action. On another tack, I’m normally not given to bouts of emotion in movies, especially for characters I’ve just been introduced to, but this scene made me profoundly sad. I wanted to yell at the characters to take a picture before painting over the ruler markings. Lost milestones can never be recaptured. Object lesson about no bumpers in real life. A good point that’s made on the wrong occasion. 50 cents for the F word. C’mon, charge him $10. The only way he’ll stop saying it is if it hurts a little. “Everything’s a line.” Trouble on the home front. Astros game. Clemens striking out batters half his age. Wonder how he was able to do that. I apologize for my insensitivity, but this was way too easy. Hawke has “the talk” with his kids. Always an awkward topic…especially when broached at a bowling alley. Classy! Nice long take of Hawke and his son hiking in the forest. And some great dialog about how perplexing females can be to teenage boys…as well as grown men. Mason gets a red letter edition and a rifle for his 15th birthday. A mixed message? I suppose the commonality is that both are types of weapons: a sword and a shotgun. How do idiots like this obtain jobs teachers? I’d really like to shove this guy’s face into the stop bath. Commentary on humans becoming robots is profound. I’ve used the same argument for why we’ve become so captivated by zombies. Feeling the weight of the “empty nest” is a touching moment. However, due to her poor choices in husbands, Mason’s mom brings middle-aged loneliness on herself. “The moment seizes us.” Interesting life philosophy. A beautiful location, profound dialog and pitch-perfect acting make this scene a poignant punctuation mark at the end of an elegant, thought-provoking film. Final analysis: not an earth-shattering story, but a staggering achievement in film. Rating: 3 out of 4 stars. 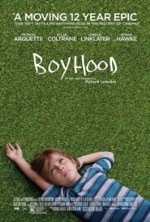 An insightful, meaningful survey of modern boyhood, brilliantly acted and directed. We’ve all seen dozens of movies where different actors were used to portray a character at different stages of his life. Many times, the child or teen looks nothing like the adult version of the same character. Director Richard Linklater has devised a unique solution to this casting conundrum by filming the same actors over a twelve year period. The end result of the director’s audacious and ambitious filmic gambit is nothing short of astounding. By following the same family over an extended period of their lives, the viewer can more readily identify with the characters while also feeling emotionally connected to them. This kind of familial familiarity only comes from well constructed and conveyed character histories. While the adult actors sustain noticeable, yet minor, physical changes over the years, the kids, who were filmed at different checkpoints between the ages of six and eighteen, undergo the more drastic transformations. A perfect compliment to the film’s naturalistic aesthetic, watching the kids’ incremental growth is like experiencing a time condensed overview of the struggles, successes and significant events during their turbulent childhood. Whereas the adult story lines frequently focus on less compelling, soap opera style subplots, the through line involving the children’s journey from K-12 and beyond is thoroughly mesmerizing. In the same regard, even though Ethan Hawke and Patricia Arquette turn in fine performances, it’s Ellar Coltrane and Lorelei Linklater (the director’s daughter) who captivate us throughout the nearly three hour decade-spanning drama with their realistic portraits of modern young people. When all is said and done, it’s the maturation of these two burgeoning actors that furnishes the movie with its groundbreaking novelty. Without their perpetual presence and precocious performances the movie would be just another well acted, well directed drama. So now the question is, does Linklater have another dozen years in him to make the sequel, Girlhood? Nice archival footage of the real team. Always a plus in these true story sports films. “A perfect effort from snap to whistle.” I’m inspired. However, Caviezel’s non-modulating droning isn’t a good match for an inspiring high school coach. Perhaps he’s been playing the soft-spoken John Reese on Person of Interest for too long, but he needed to get more fired up for this role. Coach throws an opportunity in the trash. Most people in his position would die for such an opportunity. And we’re not talking about a sandwich or burger with that moniker. Nor a movie with Harrison Ford as a submarine commander. He was only trying to help his friend. What a senseless tragedy. “They’re playing just like us.” Uh-oh! Whenever you come to such a realization, it’s already too late. Field trip. Some much needed perspective. Coach Boone (Denzel Washington) took his team on a field trip to Gettysburg in Remember the Titans (2000). The location here is quite a bit different, but the result is similar in that players are forced to look beyond their own struggles and, in this case, see the problems and needs of others. “Well it sure aint Gatorade.” Ha! Correction: ain’t has an apostrophe. However, since ain’t ain’t a word and because ain’t ain’t in the dictionary, does misspelling it really matter? Team sharing session...a nice moment. See, guys can emote. I’m just glad they didn’t have a group hug. The first nationally broadcasted high school game on TV is a special one. An epic confrontation and just what the team needed to get back on track. Take a knee and raise your hat for a heartwarming finale. However, part of me sympathizes with the over-competitive dad (Clancy Brown), who wants his son to break the record. You only get one chance in life to achieve something like that. You can always raise a hat after the record’s been secured, right? I know, I know, we wouldn’t have the mushy ending that way. Final analysis: an inspiring true story about overcoming adversity with courage and integrity. Rating: 3 out of 4 stars. A meaningful story with solid performances. A lot of bang for the budget. Or is it “boom,” as #JohnMadden, who appears in the closing credits, would say? Based on the incredible real life story of one high school football team’s (the De La Salle Spartans) legendary run of 151 consecutive victories (the longest winning streak of any team in sports history), this film follows in the footsteps of the great gridiron tales of yesteryear. By now, these factual football movies have developed a well-established (well-worn?) formula: archival footage of the original team, reenactments of key games, tragedy befalling one or more of the characters, a caring/inspiring coach, a noteworthy achievement garnering national headlines, etc. 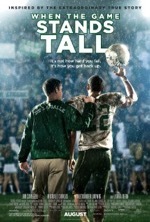 Although this film doesn’t have the same financing, production values or cinematic polish as major studio releases like Remember the Titans (2000), Friday Night Lights (2004) or We Are Marshall (2006), the story is worthy of its big screen showcase and the talent on tap (Caviezel, Michael Chiklis and Laura Dern) helps to elevate the material while shrewdly disguising its budgetary limitations. Caviezel is serviceable as Coach Ladouceur, but his monotone delivery belies the passion he seeks to instill in his players…Caviezel only raises his voice during one locker room speech. I have no way of knowing if the actor’s quiet intensity mimics the real coach’s vocal inflections or not (I’ve never met the man), but on the face of it Caviezel doesn’t seem like a natural fit for the part of a spirited football coach. Chiklis provides some comic relief and sage advice as Ladouceur’s assistant coach and, in light of Caviezel’s understated, emotionally vacant performance, is the heart of the film. Dern, as Ladouceur’s supportive wife, makes the most of a limited role, but her talents are wasted on a part that’s completely servile to the exigencies of her husband’s career. 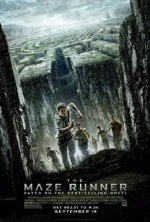 The one story line possessing the potential for character complexity is the father-living-through-his-son scenes between uber-controling dad (Clancy Brown) and his star running back son (Alexander Ludwig). Unfortunately, due to standard dialog and minimal screen time, this subplot ends up being the narrative equivalent of an incomplete pass. There are certainly finer examples of its kind in the annals of true story football accounts, but this movie has found its own niche and the fact that it’s also inspirational and family friendly is so much the better. But after the gun smoke dissipates, who will he confess to…another priest? This is actually the second line spoken in the movie, the first by Gleeson. The opening line is definitely startling though, especially when considering the location and function of the discussion. The redhead in question is Gleeson’s screen daughter in the film, played to perfection by Kelly Reilly. In case you’re wondering, Gleeson’s character sired her before he became a priest. “Bi-polar or lactose intolerant. One of the two.” Ha! Is this line overdetermined or are people really this dumb? No asterisk after “Thou Shalt Not Kill.” Good conversation. This scene contains some of the finest, most meaningful, dialog in the movie. Funny how it’s in our DNA to always look for loopholes. The colossus pees on a painting. Strange! Strange hardly covers it. This whole scene is extremely disturbing. Irish funnyman Dylan Moran (Shaun of the Dead) turns in a truly offbeat, creepy performance as the emotionally anesthetized rich man who’s relegated himself to a life of isolation and boredom…and truly bizarre behaviors. The lectern held up well. Can’t say the same for the rest of the church. The “third act revelation” is a touching scene. This is the final and finest father/daughter chat in the film. Sunday. Time to face the music. Notice that the location of the climactic showdown is similar to where the earlier “third act” interchange took place. Symbolism? Too much talk about sins and not enough talk about virtues. Good point. Maybe people would sin less if their virtues were extolled more often. Final analysis: a heavy film that asks big questions about the injustices of life. Rating: 3 out of 4. A tremendous performance by Gleeson and gorgeous Irish vistas are pluses to the glum story. Other than its trappings, performances and shockingly raw subject matter, what really sets this film apart is its unique twist on the murder mystery formula. To whit, Gleeson knows who the murderer is early on in the story, but the audience is left in the dark as to the identity of the killer—and there are plenty of possible suspects among the Irish village’s salty citizenry. The kicker is that the homicide hasn’t yet occurred and that the targeted victim is Gleeson. As a “good” priest, Gleeson will become the sacrificial lamb for the heinous transgressions (the kind you’ve heard about in the news) of unethical priests. Gleeson overcomes the urge to skip town and finds the resolve to face his accuser, a la Christ before Caiaphas, the high priest. As Gleeson approaches his would-be assassin and his own personal Calvary, the mystery transforms into a thriller that will leave the audience gasping for air. 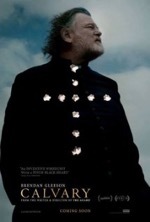 Cannily penned and helmed by John Michael McDonagh, Calvary is a multifaceted gem with much to say about the human condition. As Gleeson conducts his priestly duties, such as confession, communion, visitation, etc, the audience picks up clues along the way. This procedural element is a clever device for drawing us into Gleeson’s world while also introducing us to his parishioners, one of whom has murderous intentions toward him. The movie features numerous one-on-one conversations between Gleeson and one of the various supporting characters, and all of these exchanges are rich with meaning and laced with subtext. There’s a good deal of character complexity here and many questions are left unanswered, like: does Gleeson, who struggles with the bottle and shoots up a pub, even qualify as a “good” priest? Also, the startling final scene opens up mind-blowing implications and invites multiple readings. Any way you look at it; this is a smart, sullen and sordid story. However, if you disagree with my assessment, I’ll happily acquiesce. I’m not going to make this a hill to die on. Taking pictures of pictures in Moscow. Sounds easy enough, but it’s a dangerous occupation. Especially if you forget to return the key. “42 is complete.” Now you’ve gone and made Brosnan mad. Brosnan’s Bond always had to work really hard to dispatch bad guys, but his character here is more like 24’s Jack Bauer…casually strolling along and downing assailants as if he’d memorized enemy emplacement patterns in a FPS video game. The film is pretty soft on social commentary, but this is one instance where ethical criticism is dispensed. And it’s a point well made. Brosnan finishes his pupil’s training. An incisive scene. Not to put too fine a point on it, but this scene has a surprisingly sharp edge. Brosnan extracts information by playing an old Russian game. I don’t think I’d wait until after the second click to divulge the intel though. Either squeal from the start or hold out to the bitter end…that’s the way I see it. Corrupt agent discovers Brosnan’s “soft underbelly” and exploits it. This plot point is poetic injustice since having a relational liability is precisely what Brosnan warned his protégé about from the very beginning. Do as I say not as I do, apparently. Final analysis: a decent yarn with foreign flair and some pulse pounding action scenes. But don’t expect Bond or Bourne levels of high-octane chase/fight scenes. Rating: 2 1/2 out 4 stars. Brosnan isn’t Bond anymore, but he’s still respectable in action roles. Kudos to the movie’s casting department because this project was a perfect selection for the gracefully aging action star. Brosnan is in remarkably good shape, so espionage yarns with moderate action work are still on the table for the spy genre stalwart. Let’s cut right to the chase, this is a well acted/directed/written political thriller with beautiful European locations and a clutch of adroitly choreographed action sequences. If there’s a drawback to the film, it’s the story’s first twenty minutes, which play an elaborate game of hopscotch all over Europe while setting up the plot and key players in this international intrigue. The rapid globetrotting is exhausting, not to mention confusing, and needlessly muddies the premise to the point where we don’t know what the movie’s goal is or even where in the world the bulk of the action is going to take place. Or even if we’ll care once we figure these things out. Once the story finally settles in, which is right around the time Operation 42 is executed, the enjoyment factor begins to gradually increase since at least we know which direction the plot is headed in at that point. The reemergence of Brosnan’s former pupil is an engaging subplot, but one gets the sense that far more dramatic intensity could’ve been extracted from this teacher/student dynamic. The “enemy holds the hero’s loved one for ransom” followed by “hero exacts revenge on enemy and rescues his captive family member” is a standard ending for this genre…it would’ve been nice to see something a little less conventional here. My only other criticism of the story is the head-scratching explanation for why Brosnan’s nickname is the movie’s title. Even after its meaning is interpreted, the appellative doesn’t seem to have much relevance to the story, relegating this intriguing title to the expansive ranks of dumb movie names. 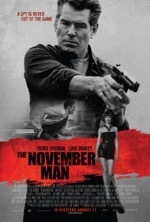 And why release a movie with November in the title in the month of August? Since it isn’t a blockbuster action picture anyway, this film should’ve been released in the fall. Bottom line: Brosnan is no longer Bond, nor does he need to be. Brosnan can churn out movies just like this one for many years to come until he decides to hang it up in the December of his career. Now that metaphor actually makes sense!